The luxury trawler yacht builder Grand Banks has a fantastic heritage and is still at the cutting edge of classic boat design and building. Grand Banks announced the arrival of 2 new models to the ranges and set Fort Lauderdale boat show as the launch platform to show them off. Grand Banks Yachts kicked off the 2009 Fort Lauderdale International Boat Show with a strong lineup of models in each of its Heritage, Eastbay and Aleutian Series, plus announcements about two new yachts that will launch early next year. The company chose this event to reveal an early look at the new 46 Eastbay SX, the first model in the Down East-styled Eastbay Series to feature Zeus pod-drives from CMD. 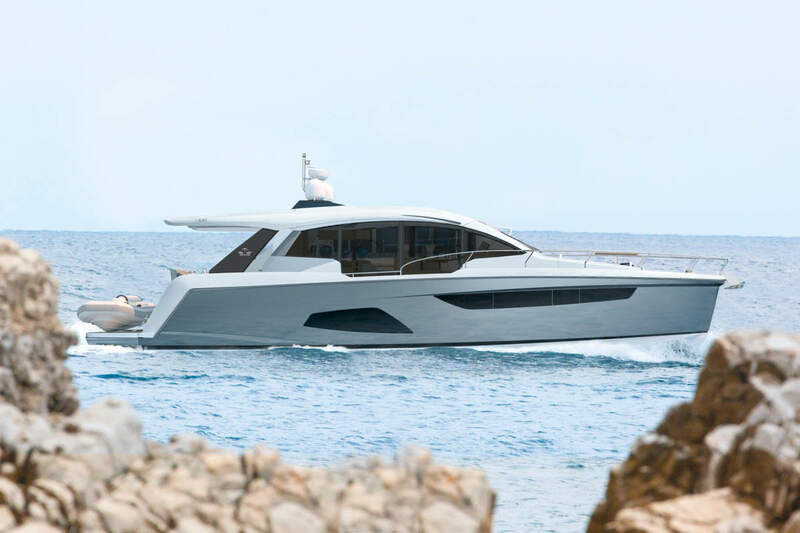 With standard twin 600-horsepower diesels, the 46SX has predicted top speeds of over 30 knots, with improved handling and fuel economy thanks to the Zeus propulsion system. The 46SX also offers a three-stateroom layout option, a noteworthy feature for a vessel of this size. “Like the 41EU before her, this boat was designed around the Zeus drive system,” said Neil McCurdy, Vice President of Sales and Service for Grand Banks. “That compact footprint opens up a lot of extra space for interior accommodations. I think owners will be delighted with every single aspect of this new Eastbay.” Grand Banks also shared more news about its new 53 Aleutian RP, a luxury raised-pilothouse model that will also launch in early 2010. The company recently marked the sale of Hull #1, before it was even out of its molds, and expects to secure more sales during the Lauderdale show. This year’s boat show features popular models in each of Grand Banks’ three yacht series: the 59 Aleutian RP, the 39 Eastbay SX, and the Zeus-powered 41 Heritage EU. The trawler-styled 41EU made its international debut at last year’s Lauderdale show; since that time it has sold into markets from Korea to Canada, America to Australia and beyond, gathering strong reviews all along the way. The 41EU is one reason that despite an economic slump affecting much of the marine industry, Grand Banks remains strongly positioned to weather the financial storm for this season and well into the future. “We’re fortunate in a number of ways, despite the current market conditions,” said GB president and CEO Rob Livingston. “Grand Banks continues to be among the most highly regarded brands anywhere. We have an incredible team of people and a growing dealer network. Our cash reserves are strong, and the company continues to invest in improving our yachts and our processes every day.” Earlier this week, Grand Banks hosted its 2009 Dealer Meeting here in Fort Lauderdale, with new dealerships in attendance including those from Greece, Australia, and the Pacific Northwest. The event was also an opportunity to recognize the top-performing GB dealers, including overall winner Grand Banks Italia in Orbitello, Italy. Winners in North America included Boatworks Yacht Sales (East Coast) and Stan Miller Yachts (West Coast). About Grand Banks – Since 1956, Grand Banks Yachts, Ltd. has built yachts of superior quality that have become industry hallmarks and earned a loyal following around the world. Renowned for their handmade craftsmanship, distinctive good looks, and tried and true all-weather capabilities, Grand Banks yachts continue to be the choice of discerning boaters today. Learn more about the company and its Heritage, Eastbay, and Aleutian series yachts at grandbanks.com.